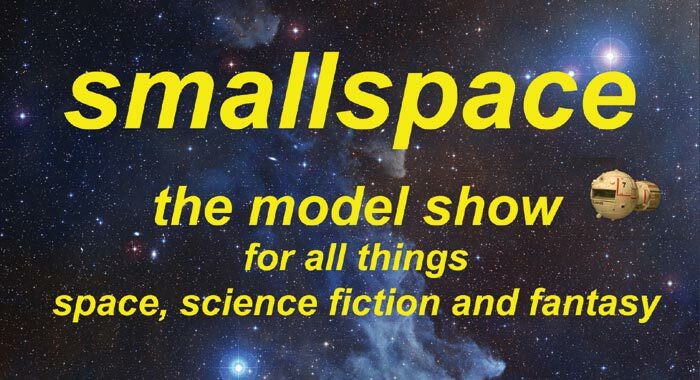 Very many thanks to everyone who took part in the second smallspace show - exhibitors, traders and, of course, our many visitors. 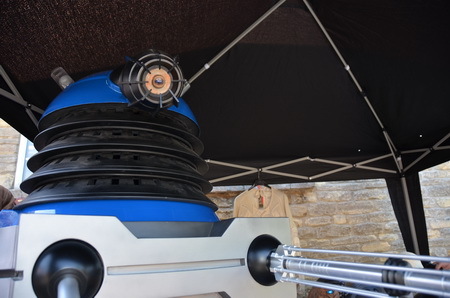 Daleks once again took over the tranquil village of Hanslope - home to smallspace. Special thanks to Steve Fletcher, Phil Stevens and Paul Hardy-Brown for co-ordinating the beasts! The steeple of St James the Great, tallest for miles around, can be seen in the background. And of course it forms the HaMeX logo! 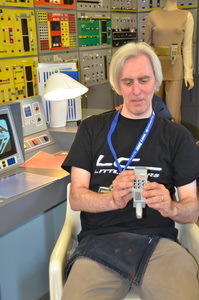 The guys for ASA - All Sections Alpha - set up a reproduction of the interior of Moon Base Alpha as from Space 1999. Top left: Paul Stankevitch and Chris Potter 'on set'. 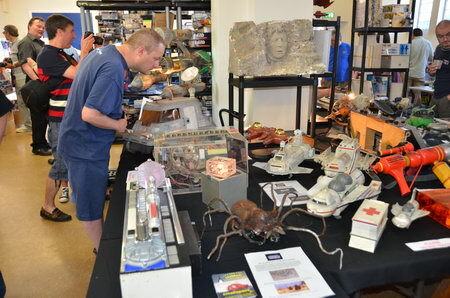 Top right: Plus there was a display of many expertly created models. Lower left: Darrell Simmonds, Simon Rhodes and Rob Carson. Lower right: They also celebrated at a Barbeque at Mat's house the night before - with Mike Tucker (far left). Left: Spittin' Image in the form of Harrison Hinton (right), his dad, Chris, oh and, er, the puppets! Right : Close up of, this time, just the puppets. 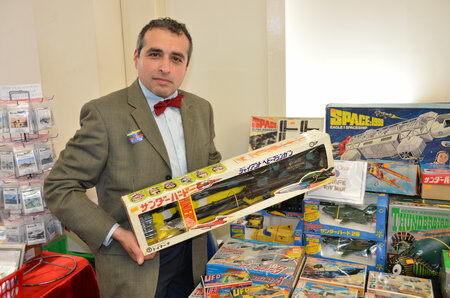 Left: David Limburg of Sante Claus, as (sort of) the Eleventh Doctor, with a Japanese Thunderbirds toy. 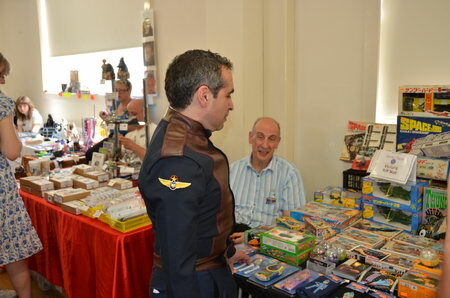 Right: Tony James of Comet Miniatures looks on bemused at David - as he's changed his costume! 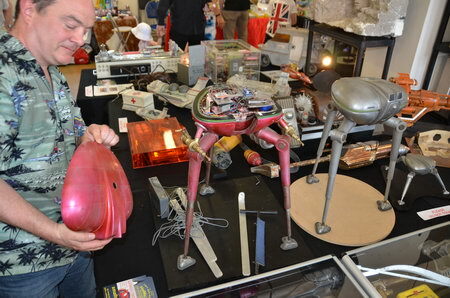 Left: Dean Eyre - and just some of the models he has built over the years. 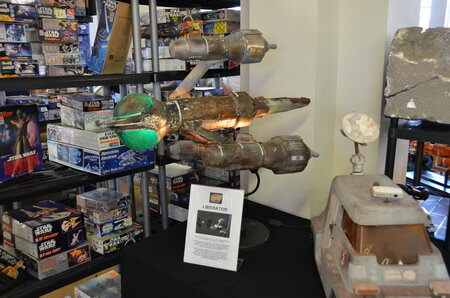 Dean was a regular winner at the Model Engineer and Modelling Exhibitions in the 1980s and 1990s. 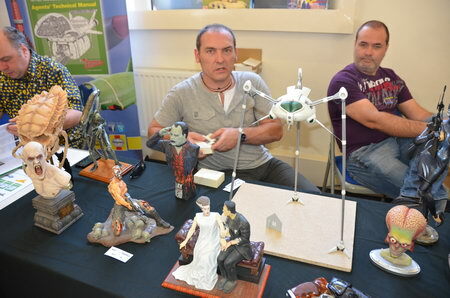 Right: Steve Fisher of FabArt. They took the entrance foyer of the Hall as we had run out of space - but it was the coolest part of the building! Right: Then sets to work on one of the young visitors. Right: and with Jerry Stone, space educator and BIS Fellow. 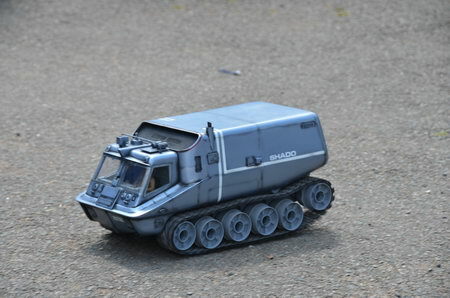 Left: Mamas Pitsillis of Studio2Models, with his giant Skydiver model and (right) his SHADOmobile, both from UFO. Left: A general view of the Main Hall, from the entrance. 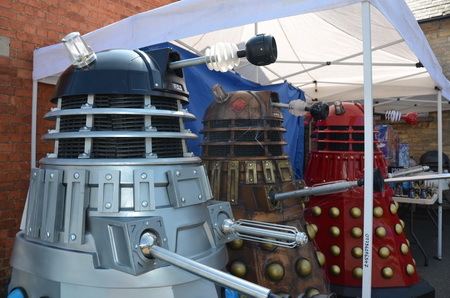 Note that Davros is keeping a beady eye (well he only has one...) on who comes in! 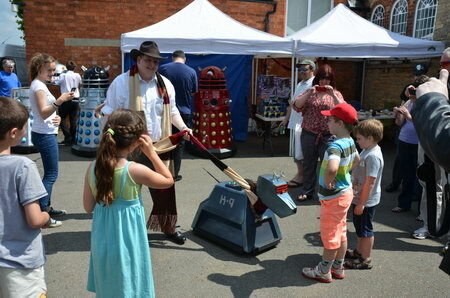 Right: a young Blake's 7 enthusiast is delighted to try out a genuine Liberator gun! 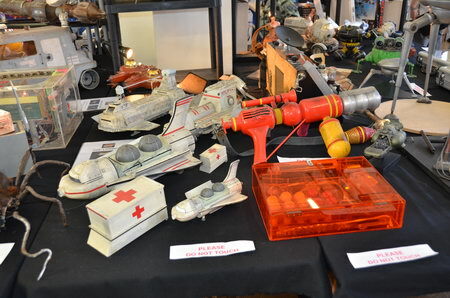 Top left: The Liberator from Blake's 7 and the Moon Buggy from the short-lived Moonbase 3. 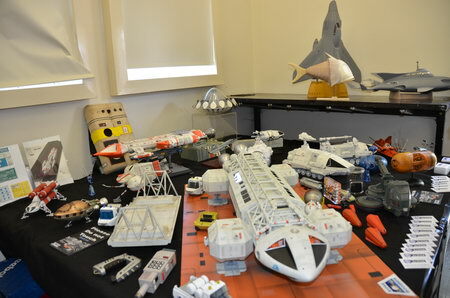 Top centre: The orange medical kit from Doctor Who : The Ark In Space and the Shuttle from Doctor Who : the Invisible Enemy. The London and Atlay Shuttle (Blake's 7) are just behind. 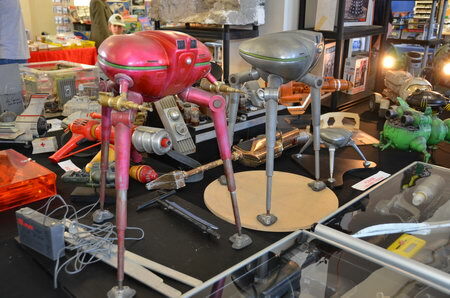 Below: two of the tripod models from The Tripods. This is the first time these have been together for over two decades! 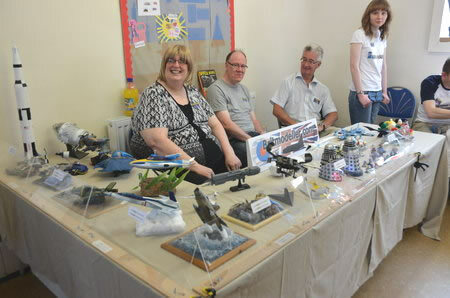 The organisers and guests relax in the Moon Base Alpha set! 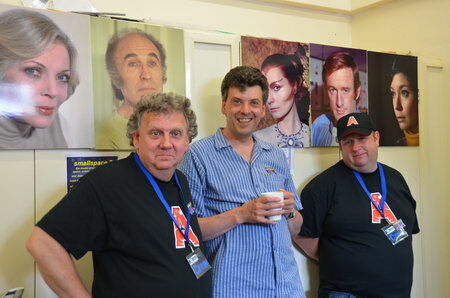 As an intriguing aside, smallspace 2 saw the reunion of several of the guys from the BBC Visual Effects Department, including (left - right) Andy Hopkinson; Mat Irvine, Mike Tucker, Alan 'Rocky' Marshall, Alan Brannan and Nick Sainton Clark. 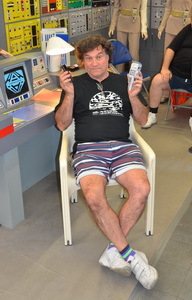 A seventh, Paul Martin, was also there, but unfortunately missed out on the photo-shoot. Though possibly the most bizarre happening over the day was when Avon (from Blake's 7) met The Doctor, (from - well you can probably work that one out for yourself). 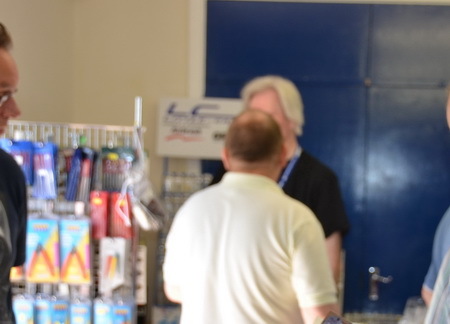 "And how's the Sonic Screwdriver for you?"